How do you feel about saving old buildings? I'm passionate about it, and so is the Queensville Heritage society. We raise money for the society with our 'Tea with the Queen' event every Canadian Victoria Day holiday weekend (that's the weekend before our Memorial Day). What are we raising the money for? A few years ago our Queen Vickie impersonator, Mrs. Bellwood, got it into her head that we'd be able to buy Stowe House. She was furious when Daniel Collins, a computer company multimillionaire from out of town, bought it, but I say he's doing a great job of preserving a piece of Queensville history, and at no cost to us. He's also a really nice guy, and... we're dating. So I'm glad he is here. Mrs. Bellwood had it in her head that that we would have been able to buy it, use it as a Queensville museum, and draw tourists from far and wide. But... do people really go to new towns for historical tourism? I say that our local heritage doesn't matter to anyone but us, so we need to find another way to draw folks to Queensville. That's why I'm so happy to see the increase in numbers among antique dealers and junk shops in our home town. 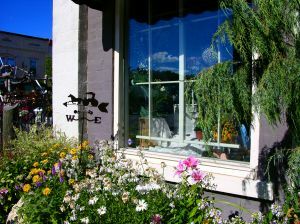 The people who would be drawn to Queensville to visit local antique shops would probably be interested in touring a historic home or two while they're here. Maybe. However, as one of the younger members of the heritage society no one really listens to me anyway. Maybe with Heidi Lockland joining now (her great-great-some more greats grandfather Homer Lockland was one of the original founders of the town) and the hope of some of her millions being invested, they'll start to listen to the younger folks. But also... well, we recently came into a bit of good news, that we can expect a windfall, perhaps, in the near future. 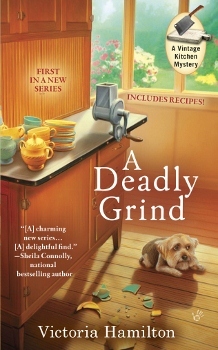 (Read all about it in A Deadly Grind) That has society members like Mrs. Bellwood and Trip Findley dreaming of buying a house, finally, to use as a museum. Trouble is, finding one. The house needs to be old, in reasonable shape (not a tear down project!) and with some historical connection to the town. I'm sure we'll manage somehow. But the reason I'm talking about this today is... I'm curious; have any of you ever gone to a town because of its historical roots? 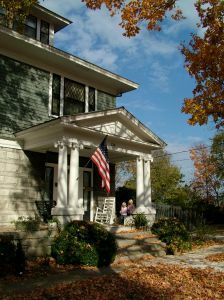 Have you ever toured historic homes? If you go to a town or village, is the heritage of it of interest to you? I'm doing kind of an informal survey, and I'll report back to the Queensville Heritage society with the info! Victoria will be participating in Cozy Mystery Reviews’ very first theme week, all Culinary Cozies. Check out Vintage Kitchen Mystery day on Thursday, October 25th, for a great slow cooker 'big batch' recipe! The trouble with museums is that visiting them cuts into shopping time! I'd have trouble dragging myself out of the antique shops, especially if they have antique linens. I love historic homes so I can see how they use the vintage kitchen wares I collect! I live in a historic home! It's in Old Town, Alexandria, and loads of people come every year to walk the streets and enjoy the historic atmosphere. At this time of year, when the wind blows and dry leaves skitter by my ankles, I can almost feel the ghosts of people who walked the streets decades before me. There are certain drawbacks with an old home, of course, maintenance for one, but I love the history and quirky nooks and crannies in old houses. Good luck finding the perfect place for your museum. We're hoping we can find the right one. There are a couple of empty homes in/near Queensville that would be ideal, but we'll have to see how things work out! I loved A Deadly Grind. I look forward to your next book in that series.